Volume 1: 1938-1940; Volume 2: 1942-1950. For music lovers Russia has always had a special reputation for rich, coal-toned basses - witness the bass parts in the Rachmaninov Vespers and, of course, Chaliapin. New Zealand's Oscar Natzke was remarkable for his enunciation, the firm quality of his voice and his physical bearing (see http://www.archives.govt.nz/holdings/gaims/aaqt/6403/8458.html). He also injected colour and emotion into the music - witness the glint in his eye in La Calunnia (Rossini I, 1, 11). Natzka was born Natzke but changed this in 1947 to try to avoid mispronunciation. He made his operatic debut at Covent Garden in 1938 and secured international renown and recording contracts especially through Parlophone. His voice is steady, dark, open to variations in volume and stentorian. During the Second World War he joined the Royal Canadian Navy and rose to the rank of Commander. He died very young at the age of 39 of a cerebral haemorrhage after collapsing a fortnight earlier during a performance of Meistersinger in New York. These discs are in two volumes with each volume comprising two discs housed in a natty single width case. Production and presentation values are very high indeed with every aspect proclaiming quality. The booklets are liberally decked out with photos and full discographical details. Notes are by Peter Downes. The only omission: the texts of the songs etc but no doubt issues of space and multitudinous copyright dictated this choice. This is a joint production of the prestige between Atoll and the National Library of New Zealand or more properly Te Puna Mãtauranga o Aotearoa. As far as can be managed the tracks are in the order of recording. They are lovingly transcribed and 'NoNoised' by Atoll proprietor, Wayne Laird. In this collection balladry jostles with grand opera and art songs (Schumann's Two Grenadiers is sung in English as are all the selections). 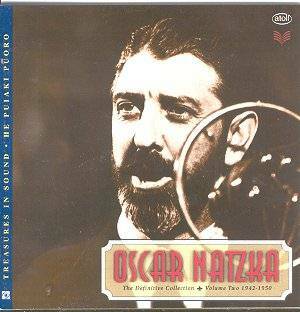 Natzka was contracted to Parlophone to sing what they put under his nose so there was bound to be the usual ration of tawdry marketplace ditties, sanctimonious religiosity, drinking songs and the sentimental traffic of the piano stool and 'at home'. Tracks 13 to 16 of Vol I, CD1 take us into the stirring world of jingoism with an orchestra conducted by Alexander Goehr's distinguished father, the conductor, Walter Goehr. All but the last track are with an additional male voice quartet. In October 1939, when the sessions took place, songs like There'll always be an England had a charge still to be felt even today. The Four Jolly Sailormen one could easily imagine being presented by the Two Ronnies (sorry, this will mean little to readers outside the UK) such is its now clunky message and delivery. In much the same bracket comes Murray's For England but with a little more restraint. There are two versions but the best sounding is Vol I, CD2, 17. The Ballads include a rather constipated setting of Myself when young by Liza Lehman - so much better handled by Granville Bantock in his three hour Omar Khayyam. Mention of Bantock reminds me of his populist setting of Capt Harry Morgan on CD2 of Vol. 2. Captain Stratton's Fancy set by Warlock mentions Morgan and is given here with an orchestra conducted by Walter Goehr. Both works bid in the direction of Stanford's Songs of the Sea. Sea Songs and Shanties thread their way through all four discs but are particularly strong in Volume 2. The first CD sets down extracts from the show Meet the Navy in the form of some truly affecting arrangements and performances of classics such as Shenandoah and Rio Grande (pronounced here as Rye-O-Grand). These are to be preferred to the populist private Toronto recordings with the close harmony group The Commodores. The Village Blacksmith with its delightfully ringing anvil is redolent of its guileless period. Moss's Floral Dance is here too along with Rasbach's Trees - a good song played straight by Natzka. So too is Invictus (Vol. I, CD2, 11) with its defiant 'Bloody but unbowed message'. Natzka is warm of voice and well recorded in The Foggy Dew. On the first volume we are treated to two versions of Tchaikovsky's sepulchral Pilgrim's Song. Hubert Greenslade is the piano accompanist for the first six tracks of CD1 vol. 1. Henry Geehl, house composer and arranger for Booseys, conducts an unnamed orchestra for the Weiss, Elliott, Mozart, Handel and Rossini tracks. Grand opera reappears in Vol. 2 with Ella giammai m'amo from Don Carlo recorded in Brooklyn Technical High School. The Messiah extracts (all 16 minutes of them) are from a private recording of a concert at Ann Arbor University. Natzka's stentorian tones are on display but also in For Behold, his ability to sing quietly. CD2 Vol. 1 has three Mozart arias of which Madamina flies along deliciously under the baton of Warwick Braithwaite whose son Nicholas (a Lyrita fixture at one time) is now active in New Zealand. The Il Seraglio aria is less effectve. Sullivan's Lost Chord is extremely well done though its half mournful half devotional sentiments speak of another age as too does Adams' The Holy City sung here with an attentive air and with a skill which is a revelation if you have been treated to this piece by spavine broken-down basses from the church choir. It is not wonderful music but Natzka does it proud. Not far removed are the two Ketèlbey ballads In a Monastery Garden and Sanctuary of the Heart each oozing a drowsy sentimentality. Broadway and 'cross-over' reached out towards Natzka as Ol' Man River (Vol. I, CD2, 3) and This Nearly Was Mine from South Pacific will demonstrate even if ultimately he was 'scratched' as a replacement for Ezio Pinza in South Pacific. Natzka is dignified though perhaps a little lacking in passion in the Rodgers' song. If by T Evans is very much of the same ilk. Speciality numbers such as Song of the Volga Boatmen, a signature piece for Chaliapin, shows Natzka's wonderful stable voice to best effect and the pp balalaika effects are well put across. In the same genre there is the creepy Mussorgsky Song of the Flea (twice) without quite the OTT cackles of Chaliapin. In Vol. 2 CD1 there are two extracts which will leave any British music enthusiast aching to hear the complete recordings. In 1942 Natzka was in Canada participating in CBC broadcasts of British opera. On 15 February 1942 Edwin Macarthur directed a Montreal performance of Rutland Boughton's Immortal Hour. 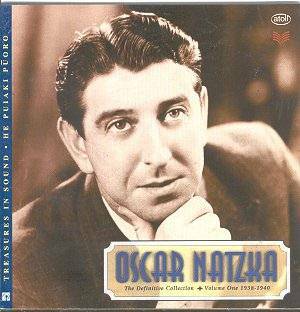 On 1 March 1942 Natzka was in the studio with Arthur Benjamin for his opera The Devil Take Her. The sound quality is superb. Does CBC have the complete recordings available? I do hope that Symposium or Dutton might be listening. The Benjamin opera is lighter in tone than the Boughton. Natzka's British music credentials can be traced back to his debut role as De Fulke in the 1930s premiere of George Lloyd's The Serf (see rather fine photo of him in costume as Sir Fulke in volume 1). Seeing the tracklist for CD2 of Vol. II I was reminded of that vaguely humorous letter to Gramophone back in the 1960s. Record shop assistants were recounting their experiences of enthusiasts trying to find music they had overheard. One came in to the shop and asked for Kodaly's Buttocks Pressing Song! It was in fact Malashkin's song Could I but express in song. It is irredeemably dull music as indeed are many of the mournful ballads in this collection. Natzka was a very fine artist but even his artistry could not lift this brummagem 'jewellery'. The original recorded material is generally in good fettle and the only real damage was a moment of distortion in Massenet's Song of Mourning and a rhythmic hushing and scouring noise in Shenandoah (Vol II CD2 track 10) but as there are three different versions of Natzka singing that swelling sea-green shanty we have not lost out unduly. The same damage afflicts Drunken sailor at track 11. The final track Now is the Hour is better known to New Zealanders as the Maori Farewell. While disrupting the chronological order (it was recorded in New York in 1948) it makes a suitable adieu. This is not the complete Natzka nor do Atoll claim that. You can hear him singing other British music in Dutton's historical Bantock collection (CDLX 7043): King's Monologue (from Act III Song of Songs) Oscar Natzke (bass-bar/Hubert Greenslades (piano) rec 1937. This thorough and splendidly finished set will appeal to aficionados of singing and those who would like to recall or discover a distinctively deep voice. One of the few truly great basses outside the old USSR. We also now know that there is a complete "Gurrelieder" with Natzka in the Schoenberg Archives in Vienna, and possibly another complete opera in UK. Of course we are pursuing these. So look out for an update release in the future. 2 Recit. Whither Fairest Art Thou Running? WITHIN THESE SACRED BOWERS from The Magic Flute (Mozart). Recit. WHITHER FAIREST ART THOU RUNNING? Aria BUT WHO MAY ABIDE THE DAY OF HIS COMING?